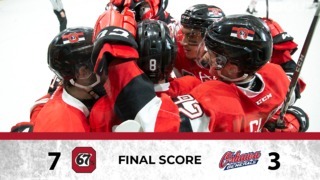 The Ottawa 67’s kept things rolling in their midweek game against the Kingston Frontenacs on Wednesday night, winning 4-1 to give the Barber Poles’ their third-straight win. 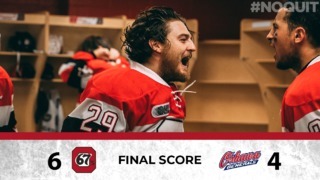 Tye Felhaber, Marco Rossi, Shasha Chmelevski and Graeme Clarke all found the back of the net for the 67’s in this one, while Cedrik Andree made 21 saves in the win at the Arena at TD Place. The Barber Poles came out strong in the first, with Felhaber opening the scoring nearly four minutes into the first with his 8th goal of the season. The 67’s would dictate the pace in this period, not allowing a shot until past the halfway point. Rossi added to his teams’ tally after forcing a turnover and finishing off the play with his 4th goal of the year, all of which have come in the last three games. Both teams would head to the lockers with the host 67’s holding a 2-0 advantage and an 11-2 edge in shots. Things got interesting in the second as Jason Robertson cut the 67’s lead in half with a shorthanded goal, but Sasha Chmelevski answered for the Barber Poles just over two minutes later on the power play. The 67’s penalty kill got a workout in the third period but held strong in killing off five minor penalties. Graeme Clarke added a goal in an empty net late in the game to secure the win. The Barber Poles will be back on the ice at TD Place to close out the week for Friday Night Live at TD Place when they welcome the Windsor Spitfires at 7 pm. Sasha Chmelevski scored his first goal of the season for the 67’s in the 2nd period. After this contest, Tye Felhaber and Austen Keating are both tied for 2nd place in the OHL lead for points with 14 each. Their linemate, Marco Rossi, has scored in three-straight games. During that span, Rossi has scored 4 goals. With his 3 points, Tye Felhaber has now extended his point streak to 6 games. Felhaber scored the first goal of the game for the 4th time this season, an OHL best. This Friday, like every Friday, the first pint’s on us with a ticket and beer available for $20. Tallboys are $7 pre-game through the first period. On Sunday, it’s our RNation Takeover game featuring a special jersey, REDBLACKS players in attendance, a pre-game event on the football field starting at 1 PM and a post-game family skate. And you can get a ticket, hot dog and pop with free refills for $25. 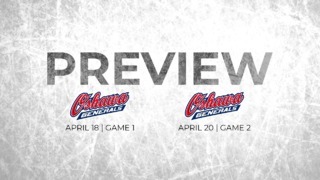 Tickets are still available at www.ottawa67s.com.